With a few days of sunshine (a total of three, I think), generally warmer temperatures (until today) and plenty of rain, this month the garden has at long last burst into life. It’s the end of April and we are finally off and running. Bursting into life … finally! But which plant has spread the most joy this month? It was a difficult decision. 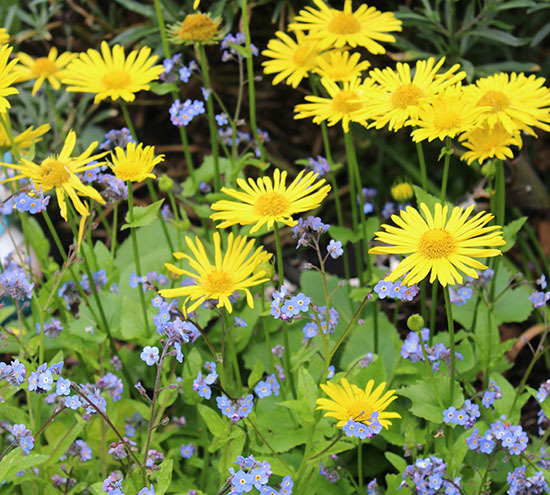 In third place, I have to mention this wonderful Doronicum and Myosotis combo (Leopard’s Bane and Forget-me-not). Each in isolation is far from imposing, but together they cheered up a small corner of my patio and put a smile on my face each time I looked their way. 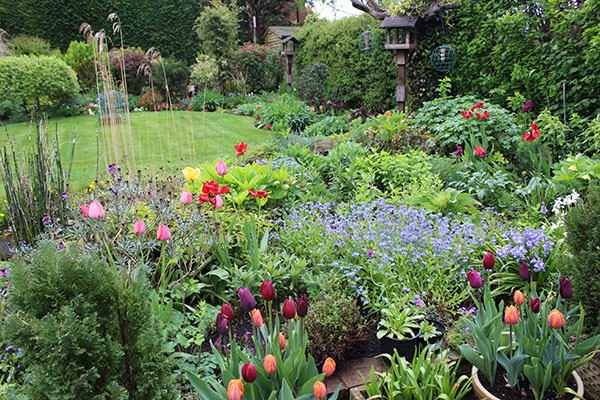 Runner-up was this stunning ‘Venetian tulip collection’ from Sarah Raven, which I crammed into pots in early January. 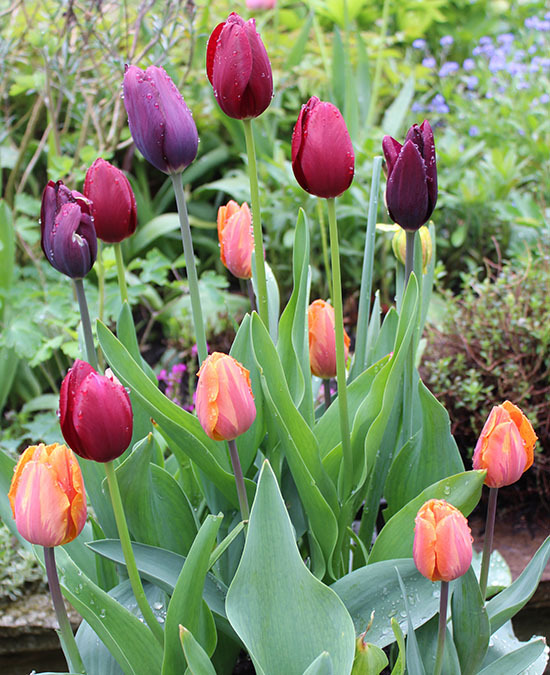 With the colours of a sunset, Tulip ‘Prinses Irene’ is superbly complemented by the glossy rich elegance of Tulips ‘National Velvet’ and ‘Havran’. Thank you Sarah – they have brought me much joy on many a grey drizzly April day. … Rosmarinus officinalis, or Rosemary to me and you. 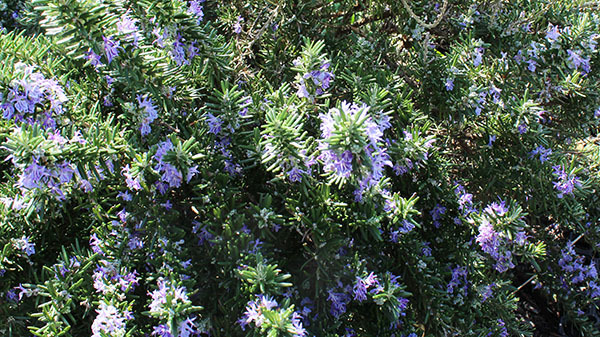 Although this woody evergreen perennial herb is better known for its culinary exploits than its prowess in the garden, this year my rosemary is smothered in delightful violet-blue flowers. 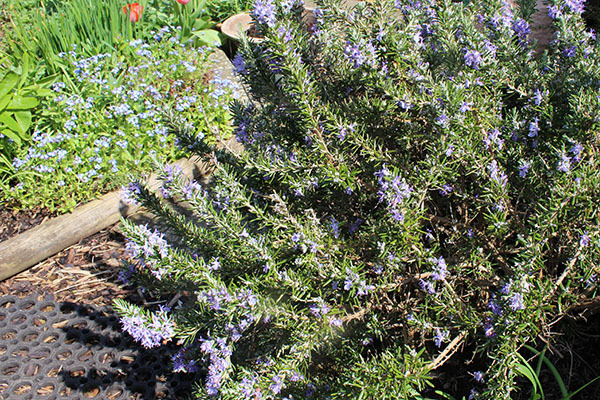 (Tip: to get your rosemary to flower make sure it is situated in a sunny spot). It has taken a few years for it to flower so magnificently, but it has been worth the wait. Not only does it look fantastic, but it is also a magnet for bees. They can’t get enough of it! It is literally buzzing with frenzied bee activity, and for this reason alone it is my plant of the month. Rosemary grows both upright and trails. Mine is currently sprawling over a path and will need a reshaping prune when it finishes flowering, but until then I am going to enjoy every minute of it.